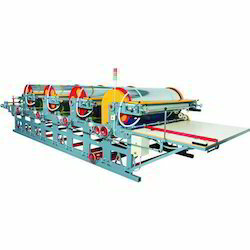 Eight Colour Flexo Printing Machine are the result of experience of more than two decades. Its constructional and functional standard meets in full measure the demand of modern flexible printing establishment.These machines have excellent registration parameters at convenient printing speed to get super quality multi color printing on various substrates with maximum economy.These machines are provided with "Anilox" Rolls duly engraved hard chrome plated to facilitate long life and uniform transfer of link resulting in sharp & glossy printing impressions.The drying system is designed to match high speed printing by providing inter color hot air blowing chambers and final hot air drying bridge to get perfect drying after printing.The machines are made-up of the following units: Unwinding-Printing Stations-Drying Chambers-Drying Bridge - Rewind Station.The impressions cylinders, stereo rolls and anilox rolls are hard chrome plated to ensure long life & efficient working of the machine. Dynamic ally balanced blowers for vibrations free working of the machine.Mohindra manufactures, exports & supplies all types of Flexo Machines available in various sizes like: 18", 20", 22", 24", 26", 28", and 30" in Four & Six Colors from Ahmadabad, Gujarat, India.We have always readily available Printing Rollers with Gears for all sizes of Flexo Printing Machine.Registration Accuracy Strong and rebuts structure for Zero vibrations Quick Loading of Print Cylinders to minimize downtime Auto stop for Web Heater Thermostat for Power saving Helical Gears for Smoother movement Hard Chromed Anilox & Cylinder Rollers for Sharper Images Digital Counter Duplex System with to unwind and rewind stations to run two jobs at the same time Reveres printing - 1 5 or 2 4 or 3 3.We have been successfully manufacturing, exporting & supplying all types of Flexo Printing Machinery since last 25 years from new Delhi, India.We are winner of 3 times National Award and 2 times International Award for Quality manufacturing. For Flexo Printing Machine, we have processed all types of material like Paper, Non-Woven, HDPE, PP, Woven Sack, LD, BOPP, etc. Paper Cup Blank 2 Colour Flexo Printing Machine are the result of experience of more than two decades. Its constructional and functional standard meets in full measure the demand of modern flexible printing establishment.These machines have excellent registration parameters at convenient printing speed to get super quality multi color printing on various substrates with maximum economy.These machines are provided with "Anilox" Rolls duly engraved hard chrome plated to facilitate long life and uniform transfer of link resulting in sharp & glossy printing impressions.The drying system is designed to match high speed printing by providing inter color hot air blowing chambers and final hot air drying bridge to get perfect drying after printing.The machines are made-up of the following units: Unwinding-Printing Stations-Drying Chambers-Drying Bridge - Rewind Station.The impressions cylinders, stereo rolls and anilox rolls are hard chrome plated to ensure long life & efficient working of the machine. Dynamic ally balanced blowers for vibrations free working of the machine.Mohindra manufactures, exports & supplies all types of Flexo Machines available in various sizes like: 18", 20", 22", 24", 26", 28", and 30" in Four & Six Colors from Ahmadabad, Gujarat, India.We have always readily available Printing Rollers with Gears for all sizes of Flexo Printing Machine.Registration Accuracy Strong and rebuts structure for Zero vibrations Quick Loading of Print Cylinders to minimize downtime Auto stop for Web Heater Thermostat for Power saving Helical Gears for Smoother movement Hard Chromed Anilox & Cylinder Rollers for Sharper Images Digital Counter Duplex System with to unwind and rewind stations to run two jobs at the same time Reveres printing - 1 5 or 2 4 or 3 3.We have been successfully manufacturing, exporting & supplying all types of Flexo Printing Machinery since last 25 years from new Delhi, India.We are winner of 3 times National Award and 2 times International Award for Quality manufacturing. For Flexo Printing Machine, we have processed all types of material like Paper, Non-Woven, HDPE, PP, Woven Sack, LD, BOPP, etc. Paper Cup Blank Two Colour Flexo Printing Machine are the result of experience of more than two decades. Its constructional and functional standard meets in full measure the demand of modern flexible printing establishment. These machines have excellent registration parameters at convenient printing speed to get super quality multi color printing on various substrates with maximum economy.These machines are provided with "Anilox" Rolls duly engraved hard chrome plated to facilitate long life and uniform transfer of link resulting in sharp & glossy printing impressions.The drying system is designed to match high speed printing by providing inter color hot air blowing chambers and final hot air drying bridge to get perfect drying after printing.The machines are made-up of the following units: Unwinding-Printing Stations-Drying Chambers-Drying Bridge - Rewind Station.The impressions cylinders, stereo rolls and anilox rolls are hard chrome plated to ensure long life & efficient working of the machine. Dynamic ally balanced blowers for vibrations free working of the machine.Mohindra manufactures, exports & supplies all types of Flexo Machines available in various sizes like: 18", 20", 22", 24", 26", 28", and 30" in Four & Six Colors from Ahmadabad, Gujarat, India.We have always readily available Printing Rollers with Gears for all sizes of Flexo Printing Machine.Registration Accuracy Strong and rebuts structure for Zero vibrations Quick Loading of Print Cylinders to minimize downtime Auto stop for Web Heater Thermostat for Power saving Helical Gears for Smoother movement Hard Chromed Anilox & Cylinder Rollers for Sharper Images Digital Counter Duplex System with to unwind and rewind stations to run two jobs at the same time Reveres printing - 1 5 or 2 4 or 3 3.We have been successfully manufacturing, exporting & supplying all types of Flexo Printing Machinery since last 25 years from new Delhi, India.We are winner of 3 times National Award and 2 times International Award for Quality manufacturing. For Flexo Printing Machine, we have processed all types of material like Paper, Non-Woven, HDPE, PP, Woven Sack, LD, BOPP, etc. 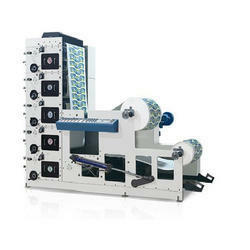 PP Bag Printing Machine are the result of experience of more than two decades. Its constructional and functional standard meets in full measure the demand of modern flexible printing establishment. 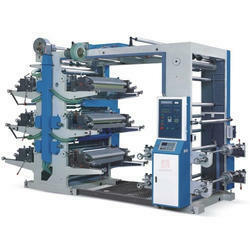 These machines have excellent registration parameters at convenient printing speed to get super quality multi color printing on various substrates with maximum economy.These machines are provided with "Anilox" Rolls duly engraved hard chrome plated to facilitate long life and uniform transfer of link resulting in sharp & glossy printing impressions.The drying system is designed to match high speed printing by providing inter color hot air blowing chambers and final hot air drying bridge to get perfect drying after printing.The machines are made-up of the following units: Unwinding-Printing Stations-Drying Chambers-Drying Bridge - Rewind Station.The impressions cylinders, stereo rolls and anilox rolls are hard chrome plated to ensure long life & efficient working of the machine. Dynamic ally balanced blowers for vibrations free working of the machine.Mohindra manufactures, exports & supplies all types of Flexo Machines available in various sizes like: 18", 20", 22", 24", 26", 28", and 30" in Four & Six Colors from Ahmadabad, Gujarat, India.We have always readily available Printing Rollers with Gears for all sizes of Flexo Printing Machine.Registration Accuracy Strong and rebuts structure for Zero vibrations Quick Loading of Print Cylinders to minimize downtime Auto stop for Web Heater Thermostat for Power saving Helical Gears for Smoother movement Hard Chromed Anilox & Cylinder Rollers for Sharper Images Digital Counter Duplex System with to unwind and rewind stations to run two jobs at the same time Reveres printing - 1 5 or 2 4 or 3 3.We have been successfully manufacturing, exporting & supplying all types of Flexo Printing Machinery since last 25 years from new Delhi, India. 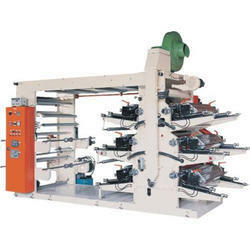 Paper Cup Printing Machine are the result of experience of more than two decades. Its constructional and functional standard meets in full measure the demand of modern flexible printing establishment.These machines have excellent registration parameters at convenient printing speed to get super quality multi color printing on various substrates with maximum economy.These machines are provided with "Anilox" Rolls duly engraved hard chrome plated to facilitate long life and uniform transfer of link resulting in sharp & glossy printing impressions.The drying system is designed to match high speed printing by providing inter color hot air blowing chambers and final hot air drying bridge to get perfect drying after printing.The machines are made-up of the following units: Unwinding-Printing Stations-Drying Chambers-Drying Bridge - Rewind Station.The impressions cylinders, stereo rolls and anilox rolls are hard chrome plated to ensure long life & efficient working of the machine. Dynamic ally balanced blowers for vibrations free working of the machine.Mohindra manufactures, exports & supplies all types of Flexo Machines available in various sizes like: 18", 20", 22", 24", 26", 28", and 30" in Four & Six Colors from Ahmadabad, Gujarat, India.We have always readily available Printing Rollers with Gears for all sizes of Flexo Printing Machine.Registration Accuracy Strong and rebuts structure for Zero vibrations Quick Loading of Print Cylinders to minimize downtime Auto stop for Web Heater Thermostat for Power saving Helical Gears for Smoother movement Hard Chromed Anilox & Cylinder Rollers for Sharper Images Digital Counter Duplex System with to unwind and rewind stations to run two jobs at the same time Reveres printing - 1 5 or 2 4 or 3 3. We have been successfully manufacturing, exporting & supplying all types of Flexo Printing Machinery since last 25 years from new Delhi, India.We are winner of 3 times National Award and 2 times International Award for Quality manufacturing. For Flexo Printing Machine, we have processed all types of material like Paper, Non-Woven, HDPE, PP, Woven Sack, LD, BOPP, etc. 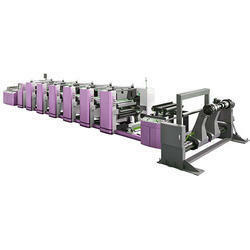 8 Colour Flexo Printing Machine are the result of experience of more than two decades. Its constructional and functional standard meets in full measure the demand of modern flexible printing establishment These machines have excellent registration parameters at convenient printing speed to get super quality multi color printing on various substrates with maximum economy.These machines are provided with "Anilox" Rolls duly engraved hard chrome plated to facilitate long life and uniform transfer of link resulting in sharp & glossy printing impressions.The drying system is designed to match high speed printing by providing inter color hot air blowing chambers and final hot air drying bridge to get perfect drying after printing.The machines are made-up of the following units: Unwinding-Printing Stations-Drying Chambers-Drying Bridge - Rewind Station.The impressions cylinders, stereo rolls and anilox rolls are hard chrome plated to ensure long life & efficient working of the machine. Dynamic ally balanced blowers for vibrations free working of the machine.Mohindra manufactures, exports & supplies all types of Flexo Machines available in various sizes like: 18", 20", 22", 24", 26", 28", and 30" in Four & Six Colors from Ahmadabad, Gujarat, India.We have always readily available Printing Rollers with Gears for all sizes of Flexo Printing Machine.Registration Accuracy Strong and rebuts structure for Zero vibrations Quick Loading of Print Cylinders to minimize downtime Auto stop for Web Heater Thermostat for Power saving Helical Gears for Smoother movement Hard Chromed Anilox & Cylinder Rollers for Sharper Images Digital Counter Duplex System with to unwind and rewind stations to run two jobs at the same time Reveres printing - 1 5 or 2 4 or 3 3.We have been successfully manufacturing, exporting & supplying all types of Flexo Printing Machinery since last 25 years from new Delhi, India.We are winner of 3 times National Award and 2 times International Award for Quality manufacturing. For Flexo Printing Machine, we have processed all types of material like Paper, Non-Woven, HDPE, PP, Woven Sack, LD, BOPP, etc. 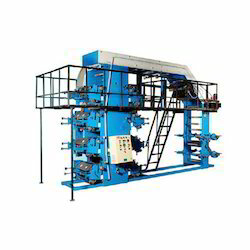 Paper Cup Blank 4 Colour Flexo Printing Machine are the result of experience of more than two decades. Its constructional and functional standard meets in full measure the demand of modern flexible printing establishment.These machines have excellent registration parameters at convenient printing speed to get super quality multi color printing on various substrates with maximum economy.These machines are provided with "Anilox" Rolls duly engraved hard chrome plated to facilitate long life and uniform transfer of link resulting in sharp & glossy printing impressions.The drying system is designed to match high speed printing by providing inter color hot air blowing chambers and final hot air drying bridge to get perfect drying after printing.The machines are made-up of the following units: Unwinding-Printing Stations-Drying Chambers-Drying Bridge - Rewind Station.The impressions cylinders, stereo rolls and anilox rolls are hard chrome plated to ensure long life & efficient working of the machine. Dynamic ally balanced blowers for vibrations free working of the machine.Mohindra manufactures, exports & supplies all types of Flexo Machines available in various sizes like: 18", 20", 22", 24", 26", 28", and 30" in Four & Six Colors from Ahmadabad, Gujarat, India.We have always readily available Printing Rollers with Gears for all sizes of Flexo Printing Machine.Registration Accuracy Strong and rebuts structure for Zero vibrations Quick Loading of Print Cylinders to minimize downtime Auto stop for Web Heater Thermostat for Power saving Helical Gears for Smoother movement Hard Chromed Anilox & Cylinder Rollers for Sharper Images Digital Counter Duplex System with to unwind and rewind stations to run two jobs at the same time Reveres printing - 1 5 or 2 4 or 3 3.We have been successfully manufacturing, exporting & supplying all types of Flexo Printing Machinery since last 25 years from new Delhi, India.We are winner of 3 times National Award and 2 times International Award for Quality manufacturing. For Flexo Printing Machine, we have processed all types of material like Paper, Non-Woven, HDPE, PP, Woven Sack, LD, BOPP, etc. Paper Cup Blank 6 Colour Flexo Printing Machine are the result of experience of more than two decades. Its constructional and functional standard meets in full measure the demand of modern flexible printing establishment.These machines have excellent registration parameters at convenient printing speed to get super quality multi color printing on various substrates with maximum economy.These machines are provided with "Anilox" Rolls duly engraved hard chrome plated to facilitate long life and uniform transfer of link resulting in sharp & glossy printing impressions.The drying system is designed to match high speed printing by providing inter color hot air blowing chambers and final hot air drying bridge to get perfect drying after printing.The machines are made-up of the following units: Unwinding-Printing Stations-Drying Chambers-Drying Bridge - Rewind Station.The impressions cylinders, stereo rolls and anilox rolls are hard chrome plated to ensure long life & efficient working of the machine. Dynamic ally balanced blowers for vibrations free working of the machine.Mohindra manufactures, exports & supplies all types of Flexo Machines available in various sizes like: 18", 20", 22", 24", 26", 28", and 30" in Four & Six Colors from Ahmadabad, Gujarat, India.We have always readily available Printing Rollers with Gears for all sizes of Flexo Printing Machine.Registration Accuracy Strong and rebuts structure for Zero vibrations Quick Loading of Print Cylinders to minimize downtime Auto stop for Web Heater Thermostat for Power saving Helical Gears for Smoother movement Hard Chromed Anilox & Cylinder Rollers for Sharper Images Digital Counter Duplex System with to unwind and rewind stations to run two jobs at the same time Reveres printing - 1 5 or 2 4 or 3 3.We have been successfully manufacturing, exporting & supplying all types of Flexo Printing Machinery since last 25 years from new Delhi, India.We are winner of 3 times National Award and 2 times International Award for Quality manufacturing. For Flexo Printing Machine, we have processed all types of material like Paper, Non-Woven, HDPE, PP, Woven Sack, LD, BOPP, etc. 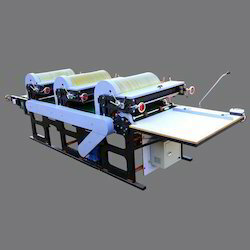 HDPE Bag Printing Machine are the result of experience of more than two decades. Its constructional and functional standard meets in full measure the demand of modern flexible printing establishment.These machines have excellent registration parameters at convenient printing speed to get super quality multi color printing on various substrates with maximum economy.These machines are provided with "Anilox" Rolls duly engraved hard chrome plated to facilitate long life and uniform transfer of link resulting in sharp & glossy printing impressions.The drying system is designed to match high speed printing by providing inter color hot air blowing chambers and final hot air drying bridge to get perfect drying after printing.The machines are made-up of the following units: Unwinding-Printing Stations-Drying Chambers-Drying Bridge - Rewind Station.The impressions cylinders, stereo rolls and anilox rolls are hard chrome plated to ensure long life & efficient working of the machine. Dynamic ally balanced blowers for vibrations free working of the machine.Mohindra manufactures, exports & supplies all types of Flexo Machines available in various sizes like: 18", 20", 22", 24", 26", 28", and 30" in Four & Six Colors from Ahmadabad, Gujarat, India.We have always readily available Printing Rollers with Gears for all sizes of Flexo Printing Machine.Registration Accuracy Strong and rebuts structure for Zero vibrations Quick Loading of Print Cylinders to minimize downtime Auto stop for Web Heater Thermostat for Power saving Helical Gears for Smoother movement Hard Chromed Anilox & Cylinder Rollers for Sharper Images Digital Counter Duplex System with to unwind and rewind stations to run two jobs at the same time Reveres printing - 1 5 or 2 4 or 3 3.We have been successfully manufacturing, exporting & supplying all types of Flexo Printing Machinery since last 25 years from new Delhi, India. Looking for HDPE Bag Printing Machine ?